Sounds like an oxymoron, but I promise you, it's creamy, delicious and yes... even healthy! And, just in time for the weekend. Happy Friday everyone! The ingredients also sounds a little, um, abnormal for dessert, and trust me when I tell you that I had the same reaction to the odd list. But once I got over the foods not usually seen in desserts and just tried it, I really enjoyed it and have made it a few times now. The secret ingredient is... ready? Avocado! It sounds odd and the combination of the green with the chocolate-brown sounds a bit strange, but mark my words, if you like chocolate mousse, you will LOVE this recipe! The avocado provides good fat and sets up a creamy consistency. The mild flavor of the avocado is masked by the other ingredients. All you will taste is the delicious chocolate! Cut the avocados in half and remove the pit. Scoop out the green flesh and put into a blender or food processor. Add the remaining ingredients (other than the berries) and combine. I recommend adding a tablespoon of sweetener at a time, as you can always add more but can't take it out if it's too sweet for your liking. Scoop into a bowl and chill until you are ready to serve. You can eat it immediately (or taste a spoonful or two) but it thickens as it sits in the refrigerator, which gives it a thick, mousse-like texture. 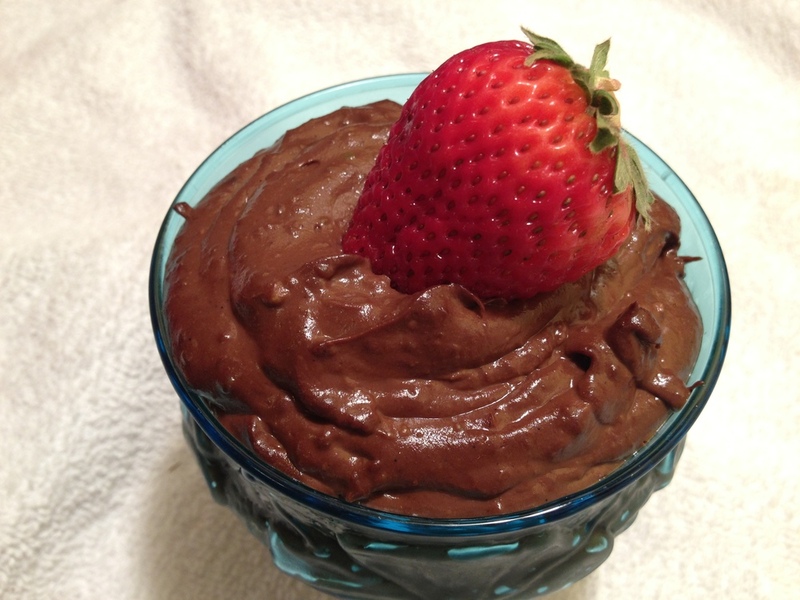 Top with berries before eating or drudge strawberries through the mousse and enjoy!